Earlier in the summer Vancouver-based bike company Brodie reached out to us to see whether we were interested in riding some of their bikes. Their line-up is pretty broad, and definitely at its best with their road, cyclocross and touring bikes. Brodie’s are some of the most common commuting and touring bikes you see in the Vancouver area, and with good reason – they represent solid, no-nonsense steel bikes. We ended up getting our mitts on their all-road monster-cross bike the ‘Monster’, and I’ve been riding it pretty steadily for the last couple of months. What follows are some of my thoughts on the market slice the Monster is trying to reach, how I felt about it and where I see it fitting in bike stables around the planet. I’ve waited until now to write this review as I felt it was important to actually spend some serious time on the bike – it seems like too many bike reviews are basically gushing advertising that does little aside from keep people happy that the choices they have already made were the right ones. I much prefer to read bike reviews where opinions are discussed and where the demands being placed on a bike are actually realistically considered. So, as with my previous notes on my running gear, that’s what I’m going to try and do. First things first – I’m me. I am tallish (over six feet), and probably somewhere around 85kg. I rode a size large Brodie Monster. I am a strong believer in small bike stables and using one machine for multiple applications. 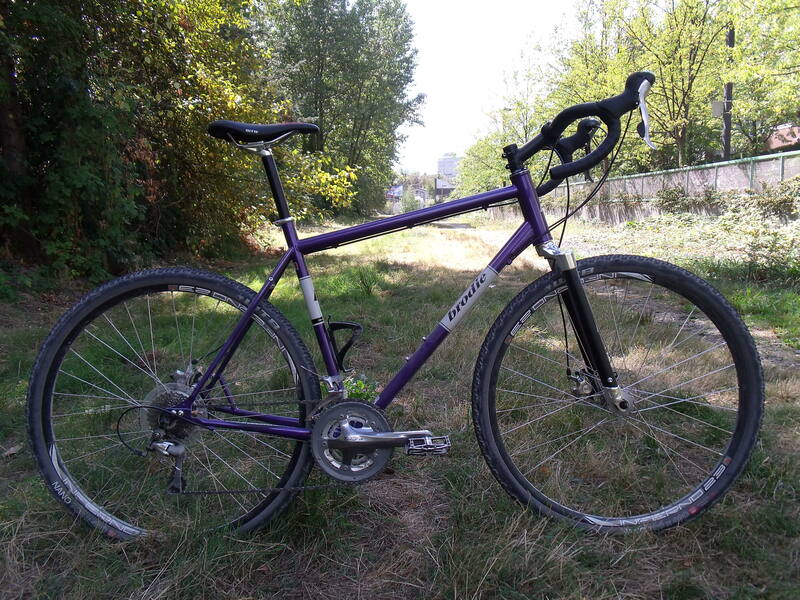 I currently only own one bike and it is a Surly Ogre which I use from everything from commuting and touring to bike-packing, mountain-biking and riding Vancouver’s China Creek teacup bowl. I was interested in the Brodie Monster as it seemed to represent Brodie’s best effort in that direction of multiple applications and maximizing cross-compatibility. 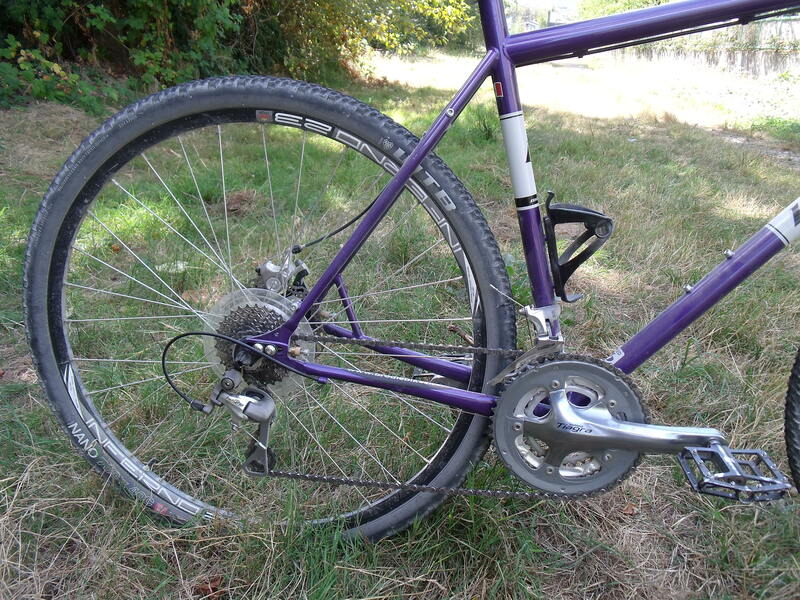 It actually uses the same frame as both the Unibomber (a single speed 650b MTB) and the Tiger (a hard tail 650b MTB). The feature of the frame that makes all these different builds possible is the sliding dropouts. This was my first time on a bike with this feature, and I was particularly curious about how it would hold up. I was concerned initially that I would experience sliding under load, creaking or any number of other things that would come with the addition of another join being added to the mechanics of the bike, but all of these fear were proved unjustified. Adjusting the dropouts is a breeze and they held firmly, creak-free throughout all my riding. These dropouts are a very cool idea – and one that is increasingly being seen in lots of bike of this sort of off-road breed (check out Soma’s offerings for example) I much prefer them to the horizontal rear-exit dropouts on the Surly Ogre which are hellish to deal with when changing tires or fixing flats. 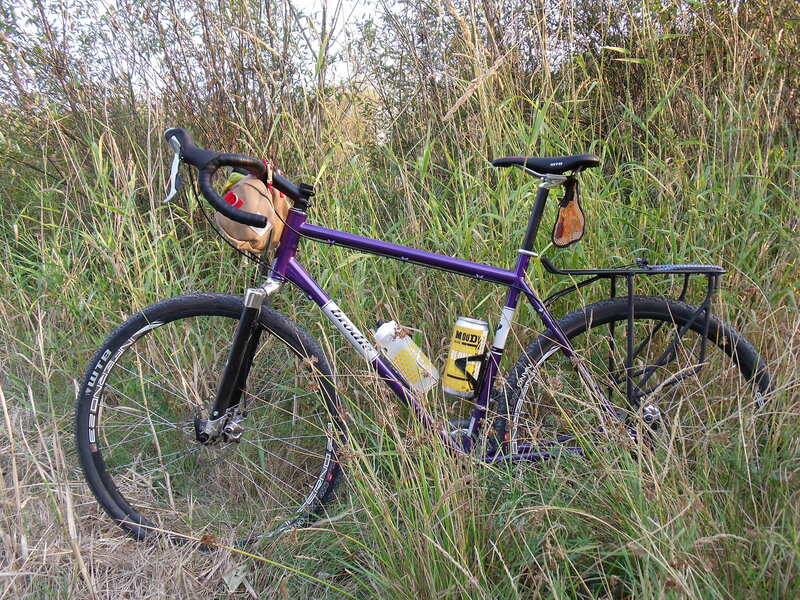 Bikepacking guru Nicholas Carman is in the process of putting together a bike built for him by Meriwether Cycles, and he has written some excellent words on the subject of dropout design in this post, which is well worth a read. Other bikes in the adventure bike genre use a swing arm style dropout which I have not ridden enough to comment on – however as another design option it looks very interesting (the Specialized Awol is an example of this design). After riding the Monster, I am totally sold on this dropout design and the adjustability it allows with regard to wheel positioning and running a variety of drive-trains – this is the way of the future. The frame rides beautifully, I was struck how even shod with large rubber the Monster felt consistently fast and responsive. I’m no expert in this field, but where the tube set used in the Ogre feels heavy and sometimes seems to absorb my efforts, my time on the Monster was marked by a sensation of acceleration and immediate feedback – in short it felt pleasantly stiff for a steel frame. The stock WTB Nano 40c tires are a really nice choice. Previous years of the bike came with the Clement Xplor 40s which I have previously ridden and I definitely prefer the Nano – to me they represent a really solid, hard wearing tire – that has handled well on gravel and dirt and has shown almost no wear despite being ridden extensively on the road. I may well go out and get a pair for my Ogre as a faster commuting/weekend touring tire. However the Monster can fit up to a ~2.1” tire – although that gets pretty darn tight. I think the biggest I would go would be a 2.0 or thereabouts. I’m really impressed that Brodie has actually bothered to make their all-road bike truly high clearance. 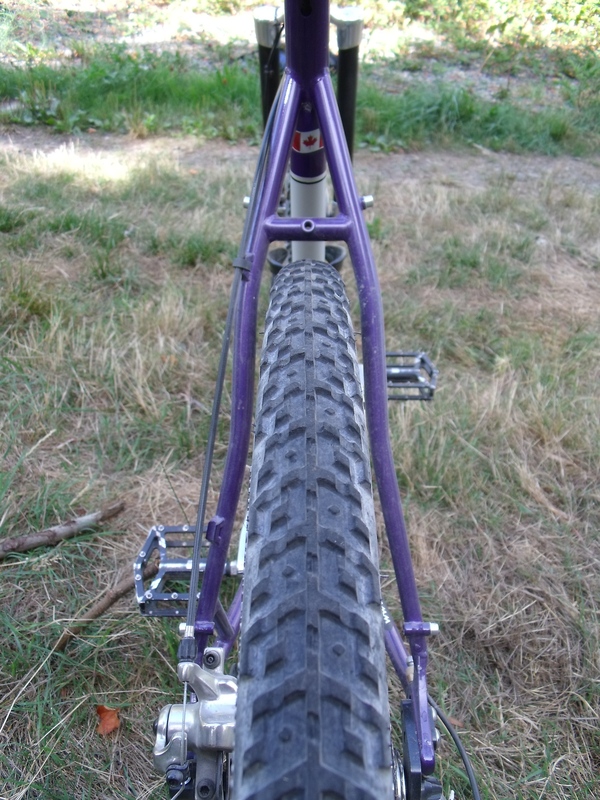 Very often when I wander through the internet world of ‘all-road’ and ‘gravel’ bikes they are basically glorified cyclocross bikes that could maybe take a 32c tire tops. I think the Monster represents a great step forward out of this trend – capable of running chubby 650b or thick 29er/700c rubber. The fork is made of bonded aluminum and features a bolt near the bottom for mounting fenders. I’m not sure quite how this works as there is no other hole or attachment point at the fork crown. Of the entire bike this for me is its weakest point. Not being able to run a variety of front fenders or front racks kind of limits the bikes potential applications in the bikepacking and touring department. In this vein, the lack of third undercarriage bottle cage is also a minor frustration. For those who are more conversant in the language of bike geometry, gravel expert and bike guru Guitar Ted has a few thoughts on the Monster here. He picks on the head tube angle and the bottom bracket height as two interesting gauges of the utility of the bike. I can’t say I noticed the head tube angle on roads and gravel, and the angle makes throwing suspension on there a little easier – the oversized heatube also allows for tapered steer tubes – a feature I definitely miss on my Ogre. As for bottom bracket height I didn’t ever feel it was too high – and it does make switching to 650b easy without worrying too much about dropping too low. My conclusions? If I were to own a Monster I think the first things to be changed would be the fork and brakes. The fork I could never really get used to, and to me it’s the hole in the whole concept – I would much prefer a steel fork with plenty of braze-ons for rack mounting options, and I think it would mate much better with the natural beauty of the steel frame itself. The brakes are not an important change-out at all, I simply don’t like the feel and modulation of the Hayes CX mechanicals as much as the BB7’s on my Ogre – but that’s really neither here nor there. Riders wanting to tackle more serious off road riding would certainly do well to upgrade them, after a couple of spills on steep descents I would say the Hayes mechanicals lack the power of BB7s. Ultimately the Monster is an elegant answer to the question of what to ride on long jaunts off road. As bike manufacturers scramble to fill this growing niche of riders tackling longer and harder rides off road, it’s fascinating to watch what designers think constitutes a capable machine. The Monster’s geometry and frame features like real tire clearance, sliding dropouts and oversized head tube provides a versatile platform for a range of different bike builds. Imagine it as a big-rubber 700c touring bike, a hard-tail XC sled or a 650b dropbar dirt-road ripper…now go build it.